Lakes and Dales presents Penrith Mountain Rescue with the defibrillators. “We’ve been needing these defibrillators for a long time, so for Lakes and Dales Co-operative to donate them to Penrith Mountain Rescue is absolutely amazing." 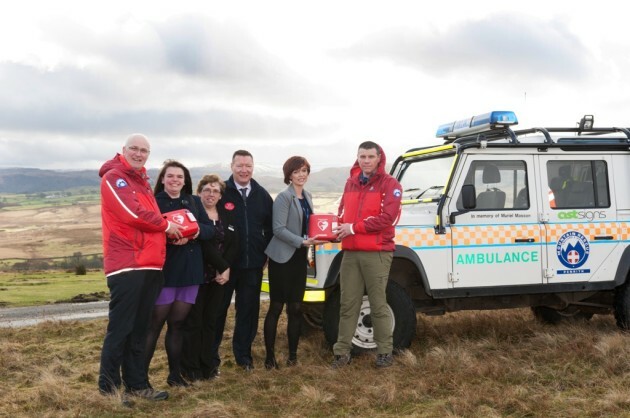 Lakes and Dales Co-operative has donated two life-saving defibrillators to Penrith Mountain Rescue, to help people needing assistance in the mountains and local community. The new equipment means that the charity will now have a defibrillator in all three of its rescue vehicles when responding to callouts. A defibrillator is a life-saving machine that gives the heart an electric shock to restart when someone is having a cardiac arrest. Acting quickly when someone is in cardiac arrest is crucially important – every minute without CPR and defibrillation reduces their survival by 10%. Penrith Mountain Rescue celebrates its 55th anniversary in 2014. The charity is staffed by volunteers who are highly trained in all aspects of search and rescue. They cover the largest geographic area of any of the Lakes District Mountain Rescue Teams, stretching from the Scottish border in the north to the Northumberland border in the east, down the North Pennines to High Cup Nick above Dufton in the south, with the North-eastern fells of the Lake District their western boundary. Lakes and Dales Co-operative is the new trading name for Penrith Co-operative, following the merger with Scotmid Co-operative Society. There are nine Lakes and Dales Co-operative stores in the Eden Valley and Lake Districts in Cumbria, and the Weardale Valley in County Durham. Two new-look Lakes and Dales stores were opened in Lazonby and Keswick in November and December. Scotmid Co-operative has been working in partnership with the Scottish Ambulance Service since 2011 to increase access to community public access defibrillators to help save lives. The Scottish Ambulance Service has helped Scotmid to roll-out defibrillators to 35 stores and train staff in resuscitation and defibrillator use.